Many different images are associated with California. When people think of the Golden State, they think of locations like the beautiful city of Los Angeles or the iconic Golden Gate Bridge in San Francisco, they think of soft, sandy beaches, great surf, unique family attractions like Disneyland in Anaheim, and warm, sunny weather throughout much of the state. 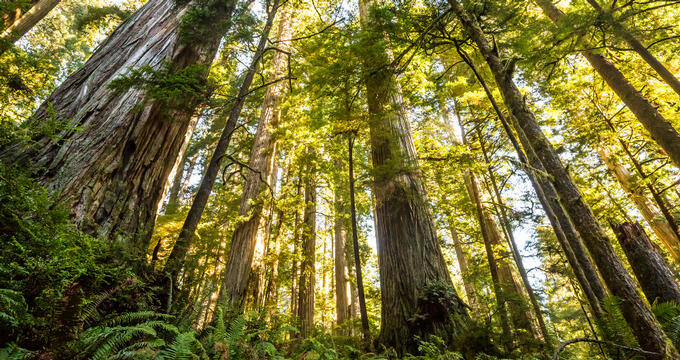 However, one of the oldest and most natural symbols of the state of California is the redwood tree, and there's no better place to see redwoods than in Jedediah Smith Redwoods State Park. Where is Jedediah State Park? Jedediah Smith State Park is located in northern California, not far from the state border with Oregon. It's situated in Del Norte County, and the closest city is Crescent City, which is around nine miles away. The park covers an area of more than 10,000 acres in total and is part of the California Coast Ranges International Biosphere Reserve. Getting to Jedediah Smith State Park is very easy and it's a key stop for many people traveling along the Pacific Highway. Follow US Highway 199 to get to the park, or simply follow signs for Crescent City and then take Howland Hill Road. If you plan on visiting Jedediah Smith Redwoods State Park, there are a few things to be aware of. First of all, it's generally agreed that the best way to experience this state park is actually by car. This is part of what makes the Jedediah Smith State Park experience so unique; you can simply follow Howland Hill Road, which runs for around six miles in total, through the park. It's one of the most scenic drives in all of North America and lets you witness and experience the incredible might and majesty of the redwoods in a very special way. The park is open all through the year and you don't need to pay any admission fee to enter. In terms of conditions at the park, it's important to note that temperatures can get quite high in the summer and there are often lots of bugs around, so it's definitely a good idea to bring some repellent if you plan on opening windows while you drive through or stepping outside. It's also worth noting that poison oak is found throughout the park, so be sure to keep an eye out for this dangerous plant. Bears have been spotted in the park on many occasions too, so this is something to be aware of too. As previously mentioned, one of the best ways to experience and enjoy this state park is by car. All you need to do is follow Howland Hill Road, and you can begin this journey from either Crescent City or Hiouchi. The full trip takes about an hour in total, so it's really only a small chunk out of your day and if you happen to be passing by the area or driving along the Pacific Highway, it's definitely worth stopping off at the park and enjoying the drive. You'll see some very special sights and really feel at one with nature, a million miles from the noise and lights of big cities. The drive itself is an easy one, but there are a few important things to bear in mind. First of all, the road isn't suitable for big vehicles like RVs or campers. The road is maintained but still varies in its condition, with some potholes and rough patches to deal with. If you're worried about your car and would like to know what you're getting into before beginning the journey, you can stop off at the Jedediah Smith State Park Visitor Centers. There are two of these, one near Hiouchi and another in Crescent City. You may also spot some park rangers in the area who can offer info on the park conditions at any time of year. There's also an option to just do part of the drive and then turn around and head back, if you prefer. As well as the classic scenic drive, there are various other ways to enjoy Jedediah Smith State Park. The park is home to the Smith River, which is one of its main attractions aside from the redwoods. It's perfectly possible to park up at several locations and head off to explore the park by foot. The Smith River is particularly popular with anglers, being home to some very impressive prize trout, salmon, and other species. The state record for steelhead rainbow trout was actually broken in this state park, with a 27 pound trout being fished from the Smith River. Naturally, you'll need a valid fishing license to fish in Jedediah Smith State Park. As with many other state parks all around the United States, Jedediah Smith State Park is also home to many miles of hiking trails. There are around 18 miles of trails in total and some wonderful views to be discovered along the way. You can spend a full day here and still have so much to see and do. The Smith River is suitable for kayaking and swimming, as well as fishing, and the stunning scenery all around the park is always a big hit with photographers. You can also camp at Jedediah Smith State Park. There are around 100 different campsites spread out all around the park and you can make reservations through the official state park site. You can also view a full map of the park and choose which site you'd like to stop at. Some are close to the river, while others are more isolated and intimate. You'll also find a few different cabins available for rental around the park. These cabins are small and simple, without restrooms or cooking facilities, but they do at least have power and heat.